Another play about relationships. Is this really what the theatre craves most in 2012? Arguably, dazzling writing is welcome in any wrapper and it would seem that playwright Nick Payne could stage the Argos catalogue to universal acclaim, the way he's going. His latest work, Constellations, is a two-hander about relationships, or a relationship, to be specific. Familiar territory for West End theatre, perhaps, but in Payne's hands it comes alive. His protagonists are Marianne and Roland, the former a theoretical physicist, the latter her seducer. The story blends the universal language of attraction with the esoteric motifs of theoretical science and all the accompanying possibilities. Payne's crisp dialogue is in the hands of two genuinely exciting stars with Golden Globe winner Sally Hawkins as Marianne and Rafe Spall as Roland, who is expertly counter-seduced by Marianne's talk of infinite outcomes. It is engaging stuff; intense without being pretentious, worthwhile without straying into worthy. A review in The New Yorker, no less, called it "a singular astonishment" and spoke of Payne in the same breath as Joe Orton and Tennessee Williams. 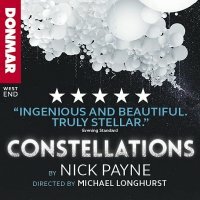 Constellations runs at the Duke of York's Theatre on St Martin's Lane from Friday 9th November 2012 until Saturday 5th January 2013. Previews run until press night on 16th November and there are matinee performances most Thursdays and Saturdays. We have tickets available now, priced from £25 to £49.50 for the very best stalls.